Whiskey Sours look different in almost every bar. They can come served up, on the rocks, or over one big cube. They've been made with sour mix, pre-bottled cocktail mix, or with fresh citrus juice and sugar. Bartenders argue about whether including an egg white makes it a Boston Sour or a true Whiskey Sour. Here’s the rub: none of these approaches are incorrect. 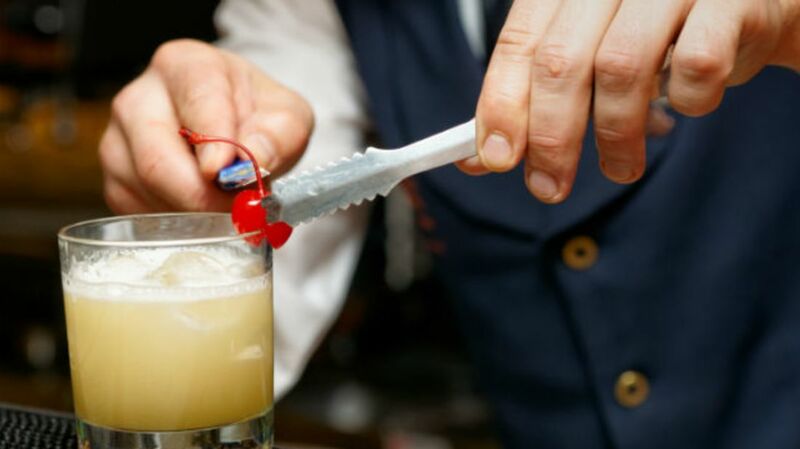 Like most other pre-Prohibition cocktails, the Whiskey Sour’s history is largely speculative. We know that it was most likely around for a long time before it was given a name. The recipe first appears in print in Jerry Thomas’s 1862 edition of The Bartender’s Guide, but we can only speculate on what came before. We do know that it follows a similar format—and is likely related—to the Daiquiri and the Gimlet. As the story goes, back in the heyday of the British Navy, sailors were given rations of liquor (usually gin or rum), citrus, and sugar. In an attempt to keep their troops reasonably sober for battle, officers including Admiral “Old Grog” Nelson advocated mixing their rations together with a bit of water. Thus, this mix of rum, sugar, lime juice, and water, a.k.a. "grog," was born. The concoction became popular enough that sailors brought it back with them. In England, drinkers preferred gin or brandy, and made it with those bases. At some point, the drink made its way to the U.S. Most commoners drank what they had access to—rum around seaports, brandy when available. At some point someone used whiskey to make grog, and the Whiskey Sour was born. Outside of a bit of fruit making its way in as garnish, it didn’t change a lot between its debut in Jerry Thomas’s The Bartender’s Guide and the end of Prohibition. After World War II, bars started to adopt sour mix, a novel product that simplified bartending. By the 1960s, sour mix had become the norm, and it wasn’t until the 1990s that bartenders began experimenting with fresh ingredients again, and that trend has since intensified. Now, the version of Whiskey Sour you get depends on where you look. Freshly squeezed juices are almost expected in most restaurant environments nowadays, and if there’s sour mix, it may be homemade. In its simplest form, the Whiskey Sour is delicate and delicious. Some bartenders argue that it should include an egg white, an addition that makes it creamier and gives it a much richer body. With that said, the egg white wasn’t a part of Jerry Thomas’s recipe. Whether you call it a Boston Sour or a Whiskey Sour, it’s a darn tasty drink. Quite a few other variations are just an ingredient or two away. Substituting maple syrup for simple syrup will give you a Filibuster. Swap honey in for the sweetness and you’ve made a Gold Rush Cocktail. Float some red wine on top of the original recipe and it’s a New York Sour. To get more complicated, substitute lime for lemon and grenadine for simple syrup to make a New York Cocktail. Modified from Jerry Thomas’s Bartender’s Guide. Combine all ingredients in a shaker, adding the egg white last. Shake vigorously without ice for 20 seconds. Add ice and shake again for 15-20 seconds more. Strain well into a coupe glass and garnish with a drop or two of bitters.